‘Live in the present’, not actually INSIDE the present because you’ve got to think outside the box, but BE present. Enjoy the moment and give the present!! It’s that time of year when we’ve all been running around like headless turkeys, which there are also literally a lot of too! Directors looking for a Pan Asian child who is 128cm with violin skills and a mohican who can also speak Mandarin to a casting in 3 hours!! We love it and have had yet again the best year ever, thanks to all our incredible staff, parents, children and clients living the ‘Ology Life.’ We are truly grateful. We have literally had thousands of bookings for our Ology superstars throughout 2017 from TV commercials to Soaps to Hollywood feature films. It’s been beyond exciting. A few stand out jobs have been William AND Isabella Flanagan landing lead roles as Joseph and Hope in ITV’s Coronation Street. Amelia Lo shooting a TV commercial for Nestlé in Bucharest followed by a photoshoot in Paris just last week. 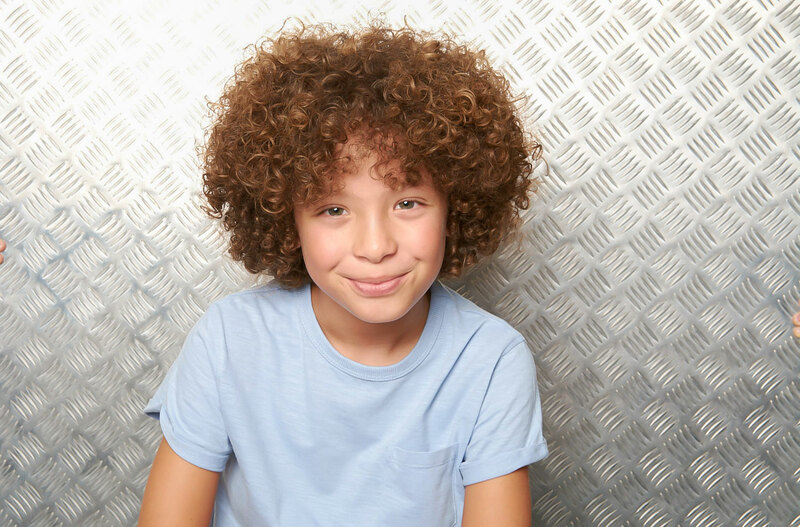 Hussam just being confirmed for the lead voice in new CBBC animation after shooting a new TV show, ‘Waffle the Wonder Dog’ a few months ago and which will air in the new year! Matthew had the best time in Disneyland Paris, shooting to crowds of hundreds with the ‘real’ Spiderman for their 25th Anniversary TV commercial! We provided so many children for lead roles in new ITV drama ‘Girlfriends’ which we can’t wait to see early in 2018. Harriet recorded a range of different TV commercials for ASDA over the Summer, with Zander starring in the new ‘Star Wars’ BT commercial and Charley filming a new commercial for OXO. Florence made her TV debut in the new Magnet commercial, whilst Amber and Eden shot a new TV commercial for Lego Ninjago. Jordan, Jake, Oliver, Cian and Connor all starred in the new Match Attax campaign and Anya featured as a lead role in CBBC’s ‘Creeped Out’! Too many superstars to mention modelled for Cosatto, John Lewis, Go Outdoors, M&S, Boden and Silvercross (and many many more!) Ology superstar families, the Brammahs, Gates, O’Tooles and Scaife-Lacys all featured in the new Tesco Christmas TV commercials, whist Lincoln, Coco, Rory and Betsy all featured in the new ASDA Christmas TV commercial campaign!! We could literally go on all day! Amelia continues to be a true superstar on set in her 4th year in Emmerdale and Grace thoroughly enjoyed her 5th season on set this summer playing lead role Eleesha in CBBC’s 4 O’Clock Club! As we enjoy some precious family time over this period we’re very excited to be launching the dedicated ‘Family Division’ on our website early in 2018! We know families are no longer 2.4 children and that’s what we love. Whether it’s a sister from another mister, brother from another mother that you’re living with, half this, step that or a mum that’s playing the ‘dad’ role too. We know clients love it so if you’re a fun, confident family with flexibility to attend castings last minute let us know! We’re rapidly becoming more and more the ‘go-to’ agency for the very best families for commercials, promotional videos and photoshoots for the world biggest brands. As we hope you all know, we’re passionate about giving the children the very best ‘money can’t buy experiences’ but also to stay innovative and excited about future prospects. We’re really hoping to make time for Ology Life in 2018 and want to inspire young people to live with passion, positivity and pure ‘stuff’!! Take a look at the Ology Life Instagram. ‘Ology Life’ is doing the right thing when no-one is watching. Knowing you are your only limit. Living each day with optimism and positivity. Feeding your body and your soul with goodness. Living your passion. Doing things that make you smile. Living in balance and knowing it’s ok not to be perfect. Nothing is. Alongside Ology Kids Casting we want to open minds and encourage children to learn, be aware and inspired. Ology Life. The Good Life. Positive Mind. Positive People and Positive Ions! We’re pretty holistic here at Ology HQ. We’re passionate about what we do and we hope it shows. If you have any ideas of things you’d like to see or you’re interested in as a parent or child please let us know – we’re always looking to improve and refine every aspect of what we do and how we do it. There are so many aspects to helping your child on the right path to their dream job whether that’s as a model, actress, TV presenter or gardener! From feeding the body and brain the right foods to preparing for a casting and getting a good night’s sleep to learning positive affirmations to banishing nerves before their first big job! All these techniques are so useful as life skills too so it’s a win-win. Thanks for joining the ride. Bring on 2018. Peace and Love!